With the growing trend for unattended machinery spaces and the growth in electronic control systems, the need for Electro Technical Officers has evolved over the last few years. With the growth in the complexity of the systems employed onboard modern vessels today there is a requirement for a specialist who is dedicated to this role. 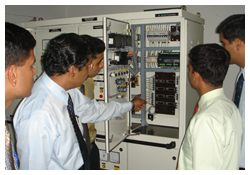 This course is designed as per the guidelines of STCW code (2010 amendments) for existing Electrical Officers to enhance their knowledge.The traditional Electrical Officers role has been integrated with modern day requirement in Electronics Computerization, Control engineering and automation.